As part of Apple’s iOS 7 preview, Senior Vice President of Internet Software and Services Eddy Cue showed off some great new Siri features coming to iOS. As part of the iOS 7 overhaul, Siri has a brand-new interface, voice monitoring, and a results panel that appears on the bottom of the screen. Siri's slightly robotic diction is no more, replaced by smoother female (or male) voices. French and German will be supported at launch, with more languages coming soon. Cue also noted that “Siri is getting a lot smarter,” with new support for listening to your voicemail, enabling and disabling services, and more intelligent searching. Among other new features, Siri now has full Twitter integration; you can tell the service, “Tell me what Dan is saying,” and it will display a full list of Dan’s tweets. It also appears that Siri has ditched Google as a search option. Previously, if you requested a search, it'd kick you out to Safari to perform it. Now, it appears to perform Wikipedia and Bing searches inline: Ask Siri to tell you about surfing, and you’ll be presented with the Wikipedia surfing page. Siri also now lets you turn system services on and off with your voice, no button-pushing necessary. If you need to turn off Bluetooth, just say, “turn off Bluetooth” and Siri will comply. Cue didn’t demonstrate all of Siri’s new features, but he did mention that users would be able to call up their voicemail and search their photo collections. More information on Siri will likely be available as iOS 7 inches closer to release this fall. 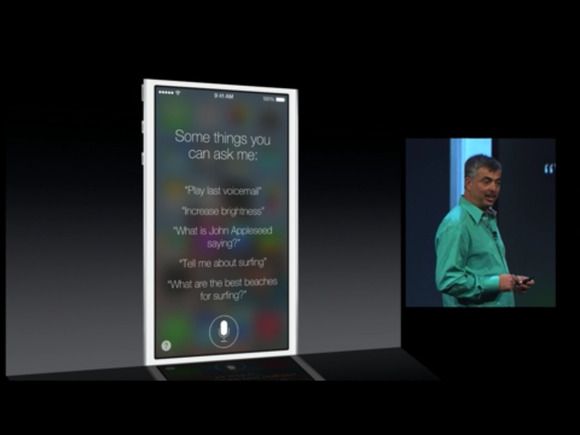 There was no word on whether this newer, smarter Siri would be available as part of OS X.